Oreo cookies are a staple in our house almost year around. When I was considering a food that began with the letter O for my first Blogging from A to Z challenge many years ago, my middle little one immediately thought of Oreos. Mmmmmm...Oreo cookies. I am not a cookie and sweets fan--but, I love chocolate and chocolate cake--and Oreos. What could I do with Oreos that is something different and easy that both the kids and I will love? I think I hit the nail on the head with our Mini Oreo Ice Cream Sandwich Sundaes. These make a fun cooking with kids project! 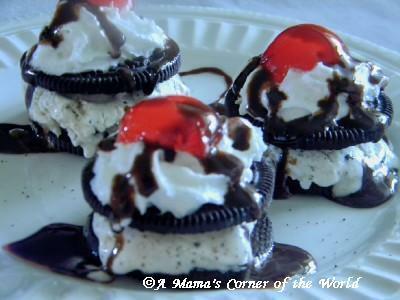 These cookie "sundaes" are ready in minutes and are so much fun for the kids to make and eat! Oh--and they are perfect for National Oreo Day too! Fill each Oreo Ice Cream Sandwich with Ice Cream. Place a tablespoon of ice cream into the center of a cookie half. Form it so that it is rounded nicely to fit the round cookie shape. Place a second cookie half on top of the ice cream and press down lightly to create an easy ice cream sandwich. Add whipped cream. Swirl whipped cream onto the top of each Oreo ice cream sandwich. Garnish the "sundae" appearance serve. Drizzle with chocolate syrup and add a maraschino cherry (or 1/4 of a jumbo maraschino cherry as we did here). Serve immediately with lots of napkins! These are quick, easy, and huge hits with chocolate/ Oreo lovers--and allow you to serve small, servings of a fun, kid friendly dessert. We make these so often during the summer--but, there is no reason not to make them year-around when the ingredients are probably frequently on hand! We also love to make these Triple Chocolate Fudge Oreo Cupcakes for almost every birthday in our little corner of the world--just in case you need a slightly different idea for National Oreo Day! We originally shared this recipe in 2012 during one of our very early Blogging from A to Z challenges! We still make these quite often--but, have never updated our photos! We decided it was time to update the post with our current favorite ingredients--and hope to have a new photo soon! CUTE! I'd love to make those. Thanks for linking up with us at Wonderful Food Wednesday! I wish I had never looked at this - now I'm dying of cravings!!! Yummy looking recipe. Thanks for linking up with Super Sunday Sync! Hi. Newest follower from Thumping Thursdays blog hop. Thank you for stopping by. These look and sound so yummy. I may have to try these after Halloween wears off. Great post, what did you do with all the oreo filling? Found your blog via the bloggy moms blog hop, I`m really enjoying the variety of blogs. We would love that you participate with some recipe like this, JUST AMAZING! Super cute and yummy-looking! I'll bookmark this for the warmer months. We had snow on the ground yesterday. I love ice cream when it's hot and this looks like a winner. Visiting from http://makeitorfixit.com. Stop by when you get a chance. I can't wait for it to warm up here so we can try this. I know my small people will love it! Thanks for sharing at Food on Friday. Since these are mini I might eat a few of them, they look super delicious! These sound like a yummy dessert and feel less guilty about eating as they are so small! This recipe is this weeks Sweet and Savoury Sunday most viewed. Stop by, grab a button and link up again with us this weekend!